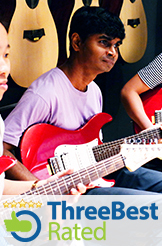 AWDI will start you on the journey of melodic expression by playing guitar riffs. Be ready to spice up your playing with the integration of guitar riffs along with advanced pedal effects. Realize the power and manage the intensity of music when played with techniques that will engage both you and the listener. The thematic focus on THE KINGDOM OF HEAVEN will take you on an exciting journey through time with special focus on the lives and episodes of the Biblical Patriarchs. Come to understand heaven’s calling upon your life, just as the fathers of our faith once did. ii) Have playing experience with familiarity of open chords in various keys. You must also be able to change chords smoothly and possess a firm strumming rhythm.